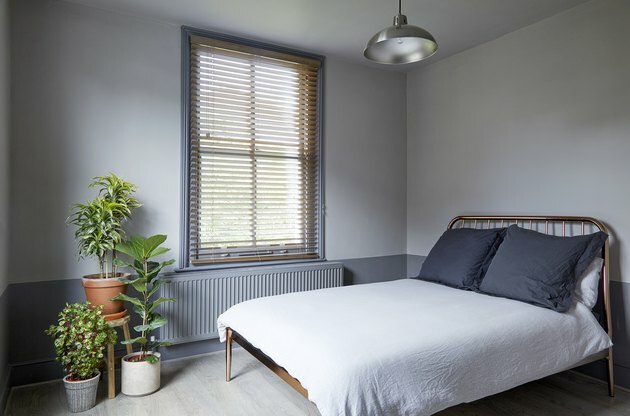 When designer and architect Sharon Toong, founder of the firm House of Sylphina, began work on a two-bedroom apartment in a Victorian building in the hip Stoke Newington area of North London, she couldn't just ask the residents what they wanted. That's because there weren't any residents — at least not yet. 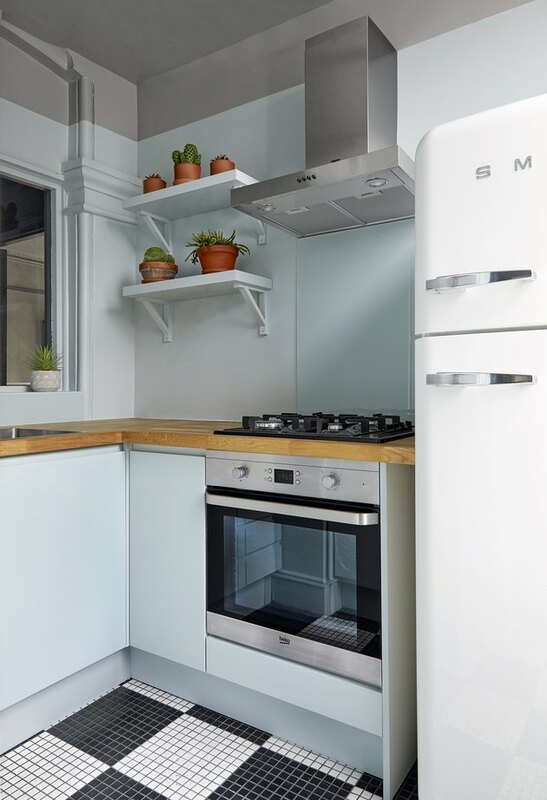 The property was being refurbished as a rental apartment for young professionals, and Toong was brought on to add some personality to the flat and make it more attractive to potential tenants. The first priority was reconfiguring the tiny kitchen and bathroom. The boiler was moved into the hallway, making room for a full-size refrigerator and freezer and a tall storage unit. 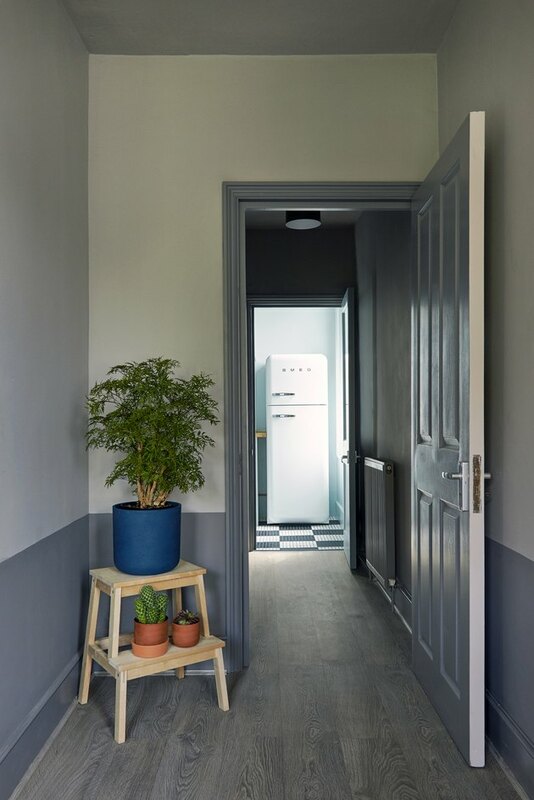 To keep within the project's modest budget, Toong relied on paint to bring character to the apartment and chose to use laminate flooring throughout. Her main splurge was the patterned floor tiles in the bathroom and kitchen. 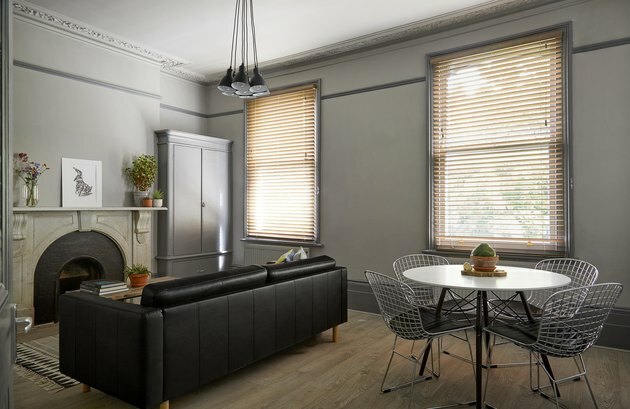 The finished project is filled with striking design details that are sure to attract a stylish tenant. A marble fireplace is the centerpiece of the reception room. A cluster of Eglo Priddy pendant lights are suspended above an Ikea Landskrona sofa and an industrial coffee table found on eBay. Toong carved out a small dining area out of the reception room. Harry Bertoia chairs surround the dining table. The room's cabinets and ornate moldings are original. Toong kept the window between the kitchen and hallway. 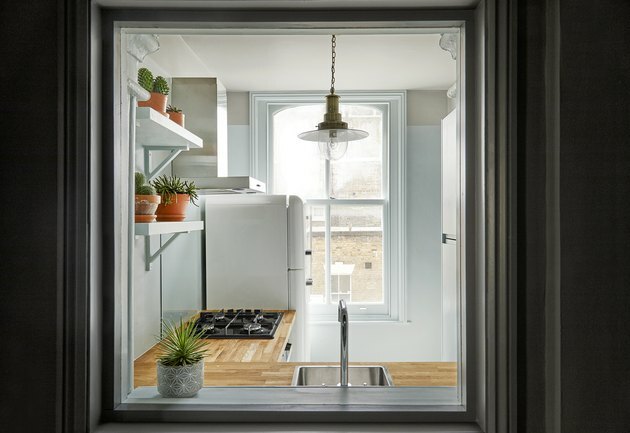 The window was actually part of the original building, and the kitchen is part of an extension that was added at a later date. The kitchen was updated with oak counters, a back-painted glass backsplash, and a black-and-white mosaic floor. Before Toong moved the boiler and installed the Smeg refrigerator, the apartment's freezer had been kept in the hallway. 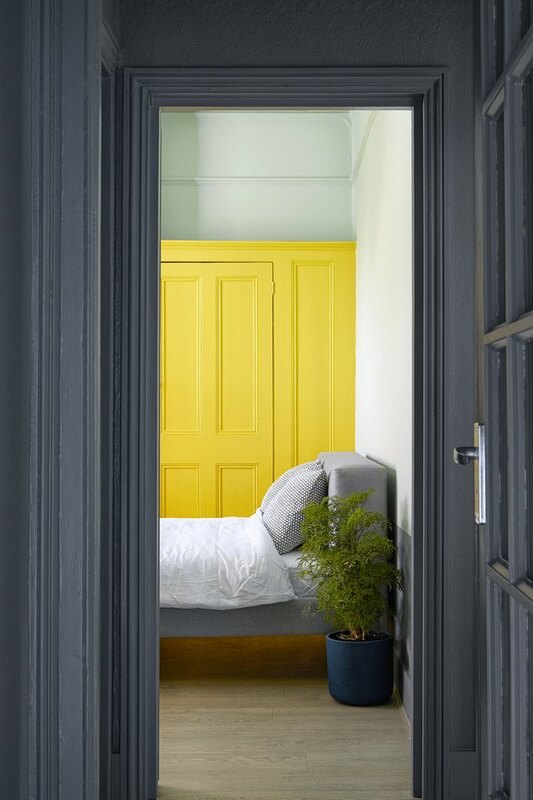 A sunny yellow paint was used to add personality to the cabinetry in one of the bedrooms. 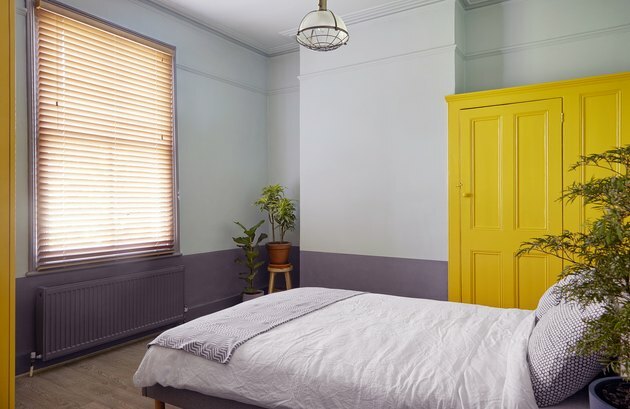 Toong chose shades of violet for the bedding and the paint used on the lower half of the wall and the radiator. An industrial pendant by Searchlight hangs above a bed from Habitat. 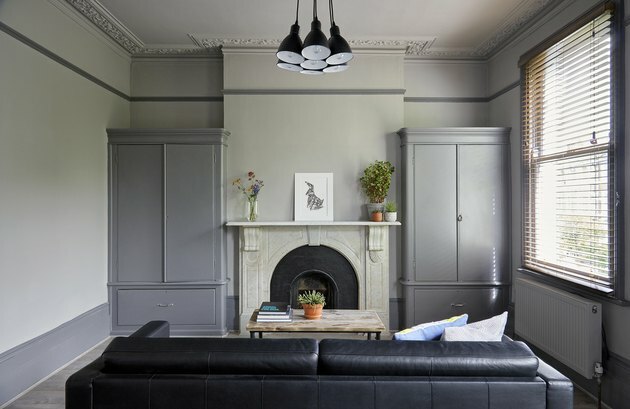 Two-tone walls add character to the hallway and the entrance to one of the bedrooms. An Ikea Bekväm step stool serves as a plant stand. Another bedroom is decorated with soft gray hues and lots of greenery. The Alana copper bed is by Made and the pendant light is by Endon. 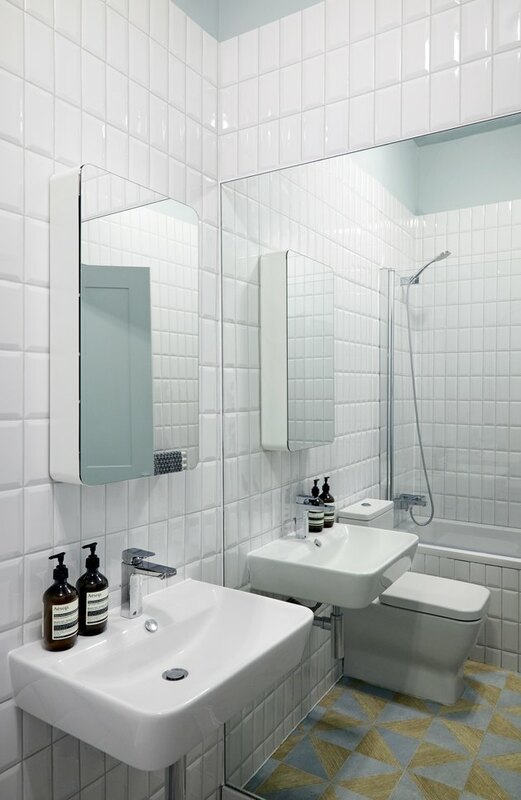 The bathroom floor is paved with colorful porcelain tiles, while the walls are lined in white subway tiles with beveled edges. The medicine cabinet is from Ikea.